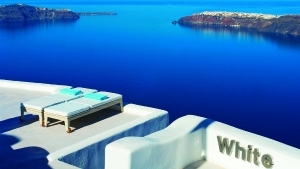 White Santorini Suites & Spa is located in an idyllic location in the beautiful Imerovigli, high on the cliffs offering amazing views. 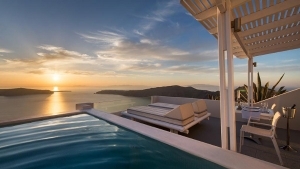 Built in 3 levels, the unit boasts some of the largest private verandas in Santorini, most with a private pool or hot tub. 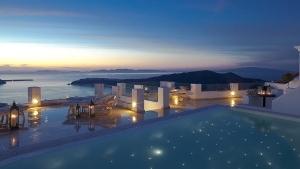 White Hotel offers stylish suites and apartments, each with a living room and deluxe bathroom. A rich complimentary breakfast can be served in the privacy of your own balcony while admiring the stunning views of the Aegean sea and the caldera. 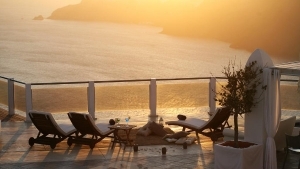 Optional White services include private dinner parties held at the dinner terrace and massage therapies upon request. Luggage Storage, Air Conditioning, Heating, Safety Deposit Box, Non-Smoking Rooms, Soundproofed Rooms, Express Check-In/Check-Out, Design Hotel, Sun Terrace, Restaurant (a la carte). 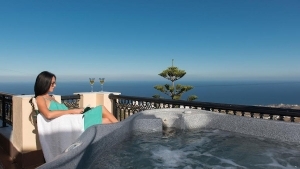 Activities: Massage, Outdoor Swimming Pool, Outdoor Swimming Pool (seasonal), Fishing, Diving. Services: Fax/Photocopying, Car Hire, Room Service, Breakfast in the Room, Dry Cleaning, Laundry, Tour Desk, Ironing Service, Ticket Service, VIP Room Facilities, Airport Shuttle, Bicycle Rental, Shuttle Service (surcharge).